I recently scored a Hewlett Packard 1670A Deep Memory Logic Analyzer and I finally had a chance to fire it up. This unit dates back to 1992 and is packed with all sorts of interesting options for connecting peripherals to it. One particular feature that caught my eye was the option to connect to an X Server. 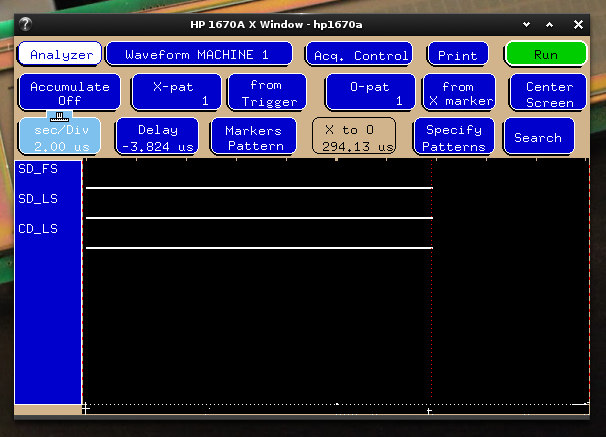 Here is the interface of the logic analyzer running on a remote X connection. I enjoy the colour scheme. I will give you a quick explanation as to how I was able to set this up by modifying a couple of configuration files to enable remote X connections. I run Linux Mint 15 with the e17 window manager (absolutely fantastic) and the gnome desktop manager (gdm). The first step was to assign my new logic analyzer an IP address as it does not support DHCP. This was fairly trivial, I merely assigned it a vacant IP on my network. Here is the configuration menu of the logic analyzer sporting classic interface design complete with the X logo. Take note of then convenient arrows to indicate which port each button adjusts settings for. I especially enjoy the rotary encoder to the right of the screen as an input device. It is quite tactile and is a fun way to input the IP address. All that it is missing is the ability to depress it. I also found some bonus help material about the hosts file on UNIX systems. I see everything has been status quo since 1992. Next, I had to make a couple of changes to configuration files to allow remote X TCP connections. I followed instructions from a question on serverfault to make this happen. 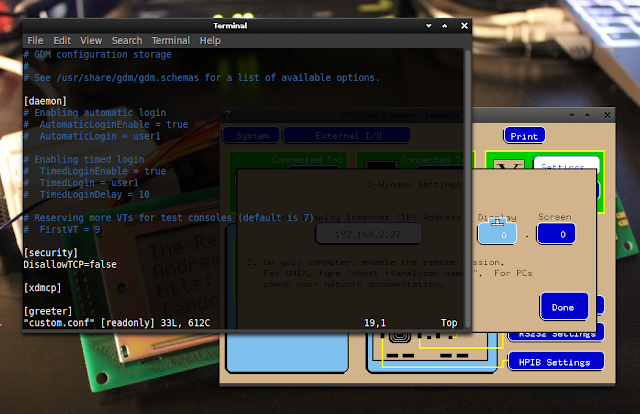 I also modified /etc/X11/xinit/xserverrc and removed the '-nolisten tcp' option. A quick restart of gdm later and I was able to establish the connection between the logic analyzer and my laptop. I find this to be a rather interesting feature of this piece of test gear. It's a shame that more devices don't implement the protocol, this is quite a cool feature if you ask me. This all reminds me very much of the Chain of Fools video from back in 2011 where Andy successfully upgraded from Microsoft's DOS 5.0 through to Windows 7 and was still able to play Doom and Monkey Island. I can definitely say that this is an impressive feat for a systems design house such as Microsoft, but the *nix's deserve some credit too! Very neat! I have the same logic analyzer and I've got to give it a try. Have you found a way to transfer raw data? Apparently these devices support NFS, but I have not tried it yet. You should be able to mount it in your local file system if it does support NFS. Not only backwards X compatiblity, but forward as well! I've got an HP Envizex X terminal that I've got running from a couple of Linux VMs, and I'd love to try my hand at getting it to display from one of these puppies! I would like to try and find a manual online for this.